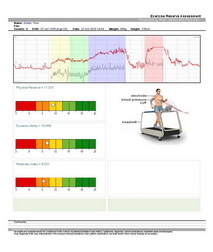 Multi-Feature Exercise ECG Test System For Optimal Stress ECG Testing. What is a ECG Stress Test? A stress test, otherwise known as an exercise electrocardiogram, is a screening tool used to evaluate the effect of exercise on your heart and lungs. Because some heart issues only become apparent during exercise, the test utilizes a treadmill or stationary bicycle to produce results that can be tracked and measured. This noninvasive, diagnostic test measures your heart rate, blood pressure and electrocardiogram (or heart’s electrical activity) before, during and after exercise. The level of exertion is increased gradually during the test to ascertain whether or not the heart and lungs are receiving enough oxygen and performing properly. The heart is a powerful muscular pump that delivers oxygenated blood to the body as required. A natural, built-in electrical system produces the pumping and contracting action at heart level. The Exercise ECG Assessment measures this electrical activity to determine heart health. During exercise, the heart pumps harder to deliver more oxygen to the lungs and body, thereby increasing heart rate. This increase in beats reveals any potential coronary issues that may not be apparent when the body is at rest. This noninvasive, cost-effective system presents a valuable initial screening test for coronary heart disease and other abnormalities or potential risks. •	Advise your doctor of any medications you are currently taking. Select medications may need to be discontinued prior to testing. Talk to you doctor. •	Wear comfortable clothing and shoes designed for walking/running. •	Ask any outstanding questions of your physician prior to undergoing the test. 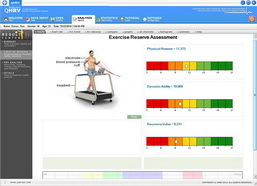 The Exercise ECG Assessment is performed in a clinic, doctor’s office or hospital. A trained technician or nurse attaches several adhesive electrodes to the chest. Wires from the electrodes link the sticky patches to the ECG machine. A blood pressure cuff is then placed on the patient’s arm and they will be instructed to begin walking on the treadmill. Throughout the test, electrodes send electrical signals from the heart to the testing system. The patient is continuously monitored until the testing is complete. Prior to attaching the electrodes, the technician will swab and abrade the sites with alcohol to create a firm hold. Each electrode is attached to a wire which runs from the patch to the ECG system. The wires transmit electrical signals from your heart to the testing system. In addition to the electrodes, you will be fitted with a blood pressure arm cuff. This will enable measurement and monitoring of your blood pressure throughout the test period. The technician will begin the test by taking your resting ECG. This measurement indicates heart activity while at rest. Next, you will be instructed to begin walking on a treadmill or pedaling on the stationary bicycle. 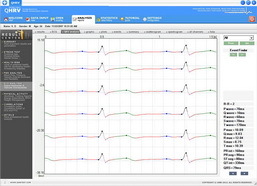 As you shift from rest to activity, the ECG system will record changes in cardiac activity. Periodically, the speed, elevation or resistance on the treadmill or bicycle will be increased to produce a corresponding increase in your heart rate. The testing continues until your target heart rate level (i.e. 85% of your maximum heart rate as predicted based on your age) has been attained. Should you experience any abnormal heart rate, dizziness or fatigue during this period, the test will be stopped immediately. After the exercise portion of the test has been completed, you will be instructed to continue moving at a slower rate until your heart beat returns to a normal state. The ECG machine and blood pressure cuff will continue to monitor and record your body activity. Once the technician is satisfied with your recovery, the electrodes will be removed and the testing will conclude. Certain situations require using medications instead of exercise to increase the heart rate. In these cases, medication would be administered then testing, minus the exercise component, would take place. Should any of these symptoms occur, the onsite technician, nurse or doctor must be notified immediately. The heart is a powerful muscle that propels oxygen and nutrient-rich blood throughout the body. The pumping motion used to transport the blood is stimulated by natural electrical signals that pass through the heart. These electrical signals originate in the SA node located in the top right chamber, or atrium. The signals follow a designated pathway, branching out to both the left and right atria. This, in turn, pushes blood into the lower chambers or ventricles through muscular contraction via the AV node. The electricity passes down the tissue separating the lower chambers then finally returns to the ventricles. This final leg of the journey causes the heart to contract and pump blood to the lungs and rest of the body. Any deviations away from this typical electrical pathway indicate cardiac issues. There may be damage due to a heart attack or heart disease present. A physician may order an electrocardiogram (ECG) test to examine the heart function should abnormalities be suspected. The ECG test involves placing electrodes on the chest to record the heart’s electrical signals. Exercise ECG using a treadmill is the standard diagnostic tool for ischemic heart disease. The test requires recording the 12-lead ECG at rest, during exercise and post exercise. By testing in this manner, doctors are able to ascertain whether or not there exists a relationship between chest pain, exercise and the typical ECG symptoms which signal myocardial ischemia. Once the patient is equipped with electrodes they will be instructed to begin exercising. During the test, the intensity of the exercise will be gradually increased to prompt an increase in the patient’s cardiac workload. The patient’s ECG, arm blood pressure and other symptoms will be continuously monitored and recorded. Symptoms which prompt test termination include chest pain or discomfort, shortness of breath, dizziness, extreme fatigue, a decrease in systolic blood pressure exceeding 10mmHg, ST-segment depression of greater than 0.2 mV (2mm), or the development of a ventricular tachyarrhythmia. 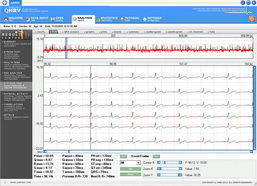 A physician or trained technician will be present throughout the testing to ensure patient safety and track important elements such as total exercise duration, moment of ischemic ST-segment change onset, instances of chest discomfort, depth of ST-segment depression and the total time required for recovery following these fluctuations is ECG. The risk associated with ECG testing is minimal however 1 in 10,000 tests do result in fatal complications and 2 in 10,000 tests result in nonfatal complications. Any signs of discomfort or abnormality should be reported and addressed immediately by onsite physicians and technicians. In a normal test subject, exercise produces a progressive increase in heart rate and blood pressure. When blood pressure does not increase or if the blood pressure actually decreases, this is indicative of ischemia and is an important adverse prognostic sign. This symptom may reflect global left ventricular dysfunction. Severe (>0.2 mV) ST-segment depression at a low workload and/or simultaneous pain that continues at least 5 minutes following the completion of the exercise component suggests severe ischemic heart disease and predicts a high risk for future cardiac events. 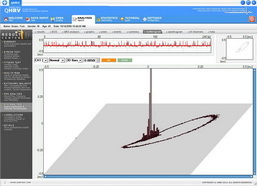 An ischemic ST-segment response produces a square wave or plateau tat is flat or downsloping. This flat depression of the ST segment is more than 0.1 mV below the baseline and typically persists for periods longer that 0.08 seconds. ST-segment changes that are do not depict this characteristic do not necessarily constitute a positive test. Similarly, conduction disturbances, T-wave abnormalities, and ventricular arrhythmias that occur during exercise should be noted but they are nondiagnostic. Additionally, in some situations where the target heart rate (i.e. 85% of the maximum heart rate based on gender and age) is not reached, a negative result is not considered diagnostic. These instances of negative or false-positive results occur in approximately 15% of all subjects however a positive result does indicate a 98% chance that cardiovascular disease is present in male subjects over the age of 50 with a history of typical angina pectoris. This cross-section will also exhibit chest discomfort during the test however the likelihood decreases significantly if there is no pain during the test. The occurrence of false-positive tests is also increased among men under 40 years of age who do no not exhibit symptoms, patients taking cardioactive drugs (e.g. digitalisor quinidine) and among premenopausal women with no risk factors for premature atherosclerosis. The overall sensitivity of exercise ECG is about 75% so a negative result does not necessarily rule out cardiovascular disease. It does, however, render the likelihood of 3-vessel or left main CAD highly unlikely. In some cases, patients will undergo a stress test during a standard ECG. This test uses a treadmill or stationary bicycle to produce increase in the heart rate, ECG and blood pressure. Intensity of the exercise is progressively increased while recording the ECG to determine the effect of exercise on the heart’s electrical activity. What is an Exercise ECG? An electrocardiogram, or ECG, produces a visual representation of electrical activity taking place at the heart level. Each contraction and pump is stimulated by a natural electrical signal that can be measured and analyzed using an ECG test system. An extension of this basic test is an exercise ECG or stress test which uses exercise or medication to induce an increased workload on the heart. By monitoring the heart’s response to stress, physicians are able to detect existing issues and predict potential future risks. Is the Exercise ECG Safe? Exercise ECG is typically considered a safe test; however, as with most medical procedures which stress the heart, it does carry a small degree of risk. During testing, in very few cases the subject may develop complications including abnormal heart rhythms. This irregularity could give rise to heart attack which may result in injury or death. As such, trained technicians and physicians are onsite during testing to alleviate any issues and resolve emergencies. The Exercise ECG test is performed in order to determine how well a heart functions. It can be used to diagnose and assess the severity of ischaemic heart disease based on how well the heart performs during exertion. 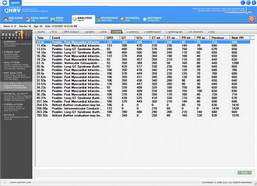 The test is also highly valuable in diagnosing and locating any blockages that may be present in the coronary arteries. Blockages cause the arteries to narrow thereby reducing the amount of oxygenated blood that is delivered throughout the body. This is often manifested in chest pain or abnormal changes exhibited during the ECG. Healthy patients in optimal physical condition are able to exercise for longer periods of time. Subjects suffering from heart conditions will be unable to perform to this same degree. Onsite physicians use exercise longevity to determine overall heart health. Many subjects feel tired or short of breath when performing the exercise, however, significant symptoms may be indicative of more serious issues. If the patient experiences extreme chest pain or dramatic shortness of breath, this may indicate the presence of heart problems. During exercise, blood pressure and heart rate increase to account for the rise in workload. If the subject exhibits an abnormal heart rate (one that is either too fast or too slow) or there is a drop in blood pressure, heart disease may be present. Electrical activity at the heart level is measured and monitored during the exercise ECG. Arrhythmias or abnormal heart rhythms may demonstrate a lack of oxygen reaching the heart. 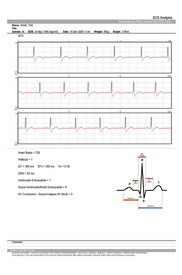 This activity is traced and monitored by the ECG and may be useful in diagnoses or assessments. Avoid eating or drinking for three hours prior to the test period. While plain water is acceptable, food and other drinks may cause exercise-induced nausea. Advise your doctor of any medications you are currently taking. You may be required to discontinue certain medications for a short period of time leading up to the test for more accurate results. Diabetics are instructed to advise their physician of all medications they are currently taking in order to produce optimal test results. The test will require a high degree of mobility so wear comfortable clothing that is loose and suitable for exercise. Men will typically be required to remove their shirt for the test while women will generally wear a sports bra. For either situation, a lightweight top or hospital gown will also suffice. Comfortable running shoes or sneakers are recommended as you will be actively running on the treadmill. Ask any and all questions you may have regarding the test prior to beginning. Your doctor should explain each step thoroughly so that you are well prepared for testing and feel comfortable. You will be asked to sign a consent form to this effect. In order to monitor your heart’s activity, adhesive electrodes will be attached to your body. Prior to attaching these sticky patches, several areas on your chest and shoulders will be swabbed and abraded to prepare the skin. For particularly hairy areas, you may be required to shave in order to create a clean surface. The ECG test is performed in a standard medical setting such as a doctor’s office, clinic or hospital. The test begins with taking your readings while at rest. After attaching the electrodes, you will be instructed to lay down on your left side with your left arm out. The physician then uses an ultrasound device called a transducer to check your heart activity. The transducer uses a conductive gel that allows it to slide easily over your skin while facilitating measurements. This process is called the resting echocardiogram and is used as a control for the subsequent exercise test. You will then be instructed to begin exercising. In most cases, the exercise will be performed on a treadmill, however some patients will use a stationary bicycle. In either case, you will be instructed to begin slowly then gradually the intensity will increase. •	Your heart rate reaches its target level (85% of a predicted maximum heart rate, based on your age). In some situations, exercise cannot be performed and your physician will attempt to replicate the effects of physical exertion using medication. A medicine such as dobutamine will be administered intravenously to increase the heart rate and produce comparable results. Throughout the entire process, your blood pressure, heart rate and ECG (heart rhythm) will be tracked, monitored and displayed using the ECG testing system. Echocardiogram images will be created for the heart’s performance while at rest, while increasing and during its peak to visually demonstrate any issues or areas where you heart may not be working to its maximum potential. These issues indicate that the heart may not be receiving enough oxygenated blood due to arterial blockages. An ECG Electrocardiogram is used to determine whether or not the heart is receiving enough oxygenated blood to perform optimally while under stress. As the heart is taxed during exercise or exertion, it requires increased blood flow to support the rest of the body however this flow may become compromised due to cardiovascular issues. This standard test is performed in a professional medical setting such as your doctor’s office, clinic or hospital. The doctor, nurse or trained technician places adhesive electrode patches on several areas across your chest and shoulders to permit ECG measurement. The electrodes transmit electricity from your heart to the ECG testing system where they are tracked, monitored and recorded. You will also wear a conventional blood pressure cuff to extract blood pressure data. The technician will be present throughout the entire procedure, monitoring you both visually and verbally. Additionally, the ECG system will be continuously monitored to track and respond to any issues as quickly as possible. Should any abnormal symptoms arise such as pain, extreme fatigue, shortness of breath or dizziness, report these issues immediately. The test concludes when you reach your target heart rate or if you are physically no longer able to perform the exercise due to significant symptoms. Once the exercise component is complete, you will be instructed to step off the treadmill and rest on a chair or bed where your heart rate, blood pressure and ECG will continue to be monitored. The entire test takes approximately 45 minutes to one hour to perform. This total time includes preparation, exercise and recovery. Typically, the doctor will review the images at a later time and prepare a report detailing his findings. We will forward a report to the patient's doctor as well as notify the patient of the results. It may take three to four days for the doctor to receive the report. In normal test subjects, exercise produces a typical increase in heart rate and blood pressure. This indicates that blood is flowing properly and allowing the heart to pump effectively therefore, the coronary arteries are presumed healthy and normal. These results are dependent on age, medical history, extenuating health conditions and the reasons for the ECG test.